I’ve known Pavitra online. Strictly online. Because there are very few blogs I follow relentlessly and her blog Masala Chai was a delight. Too bad it isn’t functional now and I missed her banter and discoveries. We met by chance online and kept at it – we’d often Skype, just talk and give each other virtual hi-fives. Then she got married, moved to the US and I was pretty sure she’ll make it big there. Some people have the drive, you see it in their soul. And one fine day, something cute popped up on my timeline. A neat pair of sunnies, totally approved by MIA. Certified for Burning Man. The name struck me as the most creative: The Cooling Glass Company. These glasses are hand-made and hand-crafted – and so unique. So since it’s a venture I truly love, I decided it’s time to give it all the attention I got this week. Presenting to you….The Cooling Glass Company on Etsy. Over to Pavitra. I am a person who needs to be engaged creatively at all times. I have a background in art management and curated a blog called MASALA CHAI for 7 years. I loved it but it was time to move and thats when ‘The Cooling Glass Company’ happened. It was all organic and not planned at all. 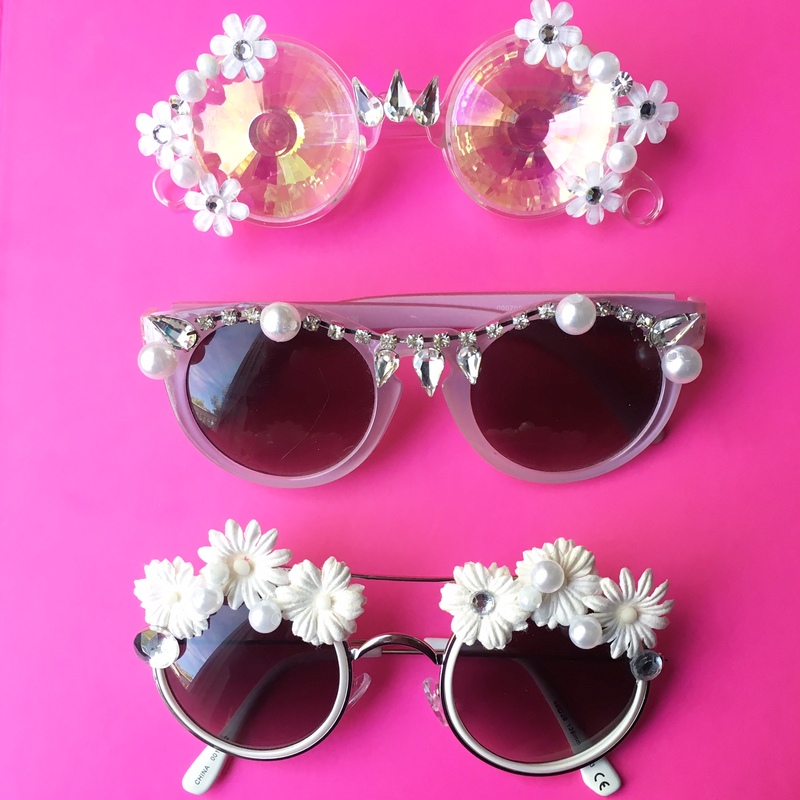 I went to a music festival this year and decided to “bling” out a couple of sunglasses, and it was so well-received and I loved the process so much. So I decided to just make a few pairs for fun. What I learnt was that it helped me relax and put me in a meditative state of mind, while also engaging my creative side. And it was so much fun, coming up with quirky ideas. What made you think of these fun glasses as a business? All of it was very organic. Just made a pair one day and the idea stuck. So, I made it my business. A super cute name, how did you come up with that, rockstar? Well, nostalgia is a big part of my creative process and I wanted to play into that. When we were kids growing up in Madras, we would call those cheap plastic shades you got at Marina beach ‘cooling glass’. So when my husband reminded me of that, I immediately thought of naming my venture ‘ The Cooling Glass Company’. It’s playful. What is so different about these glasses? The free spirited people around me. This venture is completely inspired by festival culture. A mish-mash of unabashed self expression. Ultimately it comes down to being authentic to yourself and when you are, you can be loving and empathetic to other people. Having fun with dressing up can be a catalyst for one of those things. It makes you feel good about yourself. Tell me a bit about why this matters to you, this label? Well , donating a part of it to a cause I believe in, is the most motivating thing. The second motivation is that I love to express my creativity and being able to have someone wear something I created would be amazing. I think people will have fun with it for sure. It will be a part of some good memories. And finally, what’s the future for the cooling glass company? I do not know yet, It’s not something I have put pressure on myself about, I’m not trying to grow it and crunching numbers and so on. I am happy to have it be in this scale and if it gets bigger and better, I would love that. Here’s a peek into the coolest thing from The Cooling Glass Company. And buy them here. Priced between 16 USD – 23 USD, these are a riot!